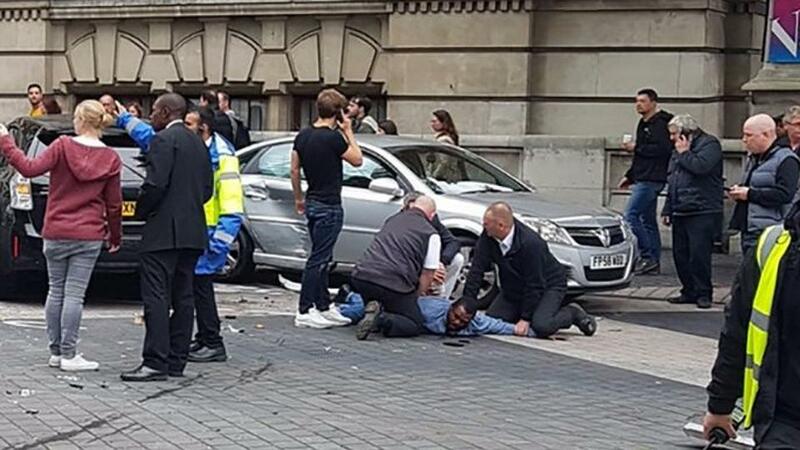 A handout picture obtained from the twitter user @StefanoSutter shows a man being restrained alongside vehicles (centre R) on Exhibition Road, in between the Victoria and Albert museum and the Natural History Museum, in London on October 7, 2017. London police said they were keeping an “open mind” after a car collided with pedestrians outside the city’s Natural History Museum, contradicting an earlier comment that they were not treating the incident as terrorism-related. A spokeswoman for the London force said counter-terrorism officers were assessing the incident but had not yet reached a conclusion as to the circumstances. Earlier a spokesman told Reuters it was not being treated as a terrorism-related incident at this stage. A number of pedestrians had been injured near the city’s museum and a man had been detained at the scene after British media reported a car had mounted the sidewalk outside the tourist attraction. London’s Metropolitan Police initially described the incident in the South Kensington area of west London as a collision and said the motive for the incident was under investigation. “Inquiries to establish the circumstances and motive are under way,” police said on Twitter. Police originally said a man was arrested at the scene but later clarified he had only been detained. A Reuters witness said there were large numbers of police, including armed officers, and paramedics at the scene although the atmosphere appeared calm. A BBC reporter at the scene said she could see a car diagonally across the road surrounded by a crowd of people with one or two on the ground. She said she was told by police injuries sustained were minor. The museum said on Twitter it was working with police after “a serious incident” outside and would provide more information later. A spokesman told Reuters that no one was being allowed into the building and people were being let out through a different exit. Britain is on its second highest security alert level, meaning an attack by militants is considered highly likely. There have been five attacks described by the authorities as terrorism this year, three involving vehicles. The Natural History Museum is the fourth most popular tourist attraction in the United Kingdom, with 4.6 million visits during 2016, according to the Association of Leading Visitor Attractions.